Filipino food is having its moment. Sour, sweet, funky, fatty, bright, rich, tangy, bold—no wonder adventurous eaters consider Filipino food the next big thing (Vogue declares it “the next great American cuisine”). Filipinos are the second-largest Asian population in America, and finally, after enjoying Chinese, Japanese, Thai, and Vietnamese food, we’re ready to embrace Filipino food, too. 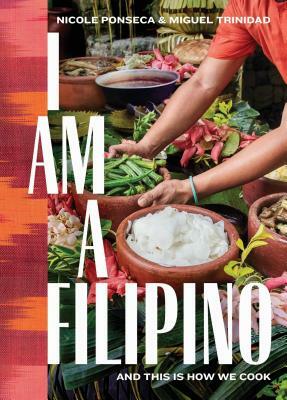 Written by trailblazing restaurateurs Nicole Ponseca and Miguel Trinidad, I Am a Filipino is a cookbook of modern Filipino recipes that captures the unexpected and addictive flavors of this vibrant and diverse cuisine. The techniques (including braising, boiling, and grilling) are simple, the ingredients are readily available, and the results are extraordinary. There are puckeringly sour adobos with meat so tender you can cut it with a spoon, along with other national dishes like kare-kare (oxtail stew) and kinilaw (fresh seafood dressed in coconut milk and ginger). There are Chinese-influenced pansit (noodle dishes) and lumpia (spring rolls); Arab-inflected cuisine, with its layered spicy curries; and dishes that reflect the tastes and ingredients of the Spaniards, Mexicans, and Americans who came to the Philippines and stayed. Included are beloved fried street snacks like ukoy (fritters), and an array of sweets and treats called meryenda. Filled with suitably bold and bright photographs, I Am a Filipino is like a classic kamayan dinner—one long, festive table piled high with food. Just dig in! Nicole Ponseca is the founder and creative director of Maharlika and Jeepney restaurants in New York City. A native of San Diego, Ponseca moved to New York to pursue a career in advertising but found her true calling upon discovering a lack of authentic Filipino food in the city and deciding to do something about it. Together with chef Miguel Trinidad, she opened Maharlika in 2011 and Jeepney one year later. Find her on Instagram @nicoleponseca. Miguel Trinidad is the executive chef and co-owner of Maharlika and Jeepney restaurants. He is a judge on Season 3 of Viceland’s cannabis culinary competition show, Bong Appétit. Find him on Instagram @chefmigsnyc. “I cracked open this book knowing very little about Filipino food, and now it’s all I can think about. That’s the power of a good cookbook: It can take a cuisine that’s unfamiliar and—through storytelling, technical education, gorgeous photography and killer recipes—transform it into a passion.